Casey Research was founded by Doug Casey, who describes himself as an anarcho-capitalist influenced by Ayn Rand, a Russian-American novelist, philosopher, playright, and screenwriter best known for her works: The Fountainhead and Atlas Shrugged. Doug Casey is a believer in less government intervention and believes when government stamps its authority on financial markets, opportunities arise from dislocations. Casey is renowned as a contrarian who looks to spot investment opportunities that go against the grain of the general market with a view to generating superior market returns and he shares his ideas in his investment advisory service newsletters. As a graduate of Georgetown University with a #1 New York Times non-fiction bestseller, Crisis Investing, and decades of investing experience to his name, Casey has the investing credentials that are the envy of most advisory services. Nevertheless, time has proven that few investors have sustained market-beating returns with Warren Buffett a notable exception. So, in a competitive arena, how does Casey fare and should you follow his company’s research? Why Should You Listen To Doug Casey? So why listen to Doug Casey? Doug Casey has earned a reputation as a contrarian providing original insights that distinguish him and his team from many other mainstream market analysts. When it comes to investing, it is generally best to take a skeptical approach to most market commentators, who frequently “talk their book”, meaning they advocate for portfolio holdings they already own. While many market gurus may be well-intentioned, few actually have earned the badge of sustained market-beating performance to deserve your attention. Hedge fund managers and investment managers in general are required to file regular SEC filings and state their holdings so you can quickly figure out how well they are doing. But an investment advisory service like Casey Research has no such obligation to comply with cumbersome regulations. Instead, Casey Research is a vehicle for Doug Casey and his team to express opinions on markets but the ideas are not necessarily executed in an investment fund. Unlike most other financial newsletter writers, Casey has earned the distinguished honor of authoring the best-selling non-fiction book in 1980, called Crisis Investing, which made the New York Times bestseller list. His newsletter is written from the perspective of an economist from the Austrian School, a school of economic thought based on the concept that social phenomena result from the motivations and actions of individuals. Austrian School economists tend to shun government intervention as interfering with natural market forces. Because Casey subscribes to the Austrian School, he butts head with mainstream economic philosophies, and by default is a contrarian. So, if you are looking for a different perspective than the one commonly touted on financial news networks, the views of Doug Casey may be quite interesting to you. The big caveat is that contrarians by nature tend to be right when stock markets peak and trough, but during the major trends up and down, they can often be on the wrong side of an investment. The Casey Report is the company’s flagship publication that merges economics and investing. A standout feature of this newsletter is the international perspective taken. To highlight why this is valuable, consider the price of gold. An investor in the United States of America will generally analyze the price and trend from the perspective of U.S. dollars. Similarly, a European investor will look at gold from their geographic perspective – priced in their own local currency. But what if the exchange rate between U.S. dollars and the local European currency has changed significantly in the past 12 months while the price of gold didn’t budget (a hypothetical scenario! ), is it possible that gold is overvalued in one region but undervalued in another? This international perspective is rare among financial newsletters, but is a key feature of the Casey Report. The International Speculator is the longest running research service provided by Casey Research. The service targets the natural resources sector with a view to spotting undervalued companies in the metals and mining industries. Keep in mind that precious metals are not dividend paying investments so they tend not to be held broadly by institutions but are heavily favored by retail traders. If you pretend for a moment that you could purchase either all the gold in the world or all the real estate in America for the same price, the smart investor according to Buffett would choose the real estate because while the purchase prices of both are identical in this imaginary scenario, only the property will generate an ongoing income stream from tenants paying rent. Over time, that income stream will eventually pay off the cost of the purchase price whereas the only way to make money from gold is for the price to rise, so you need another person to be willing to purchase it at a higher price. Casey Resource Investor includes coverage of the best resource investment opportunities across various sectors, such as energy, mining, agriculture, water, and other natural resources. The one certainty about resources is a fixed supply of them exists. However, as the global population increases and places a higher burden on natural resources, demand increases causing prices to rise. Some famous investors, such as Michael Burry, are so convinced that natural resources offer large returns over time that they have dedicated a substantial portion of their incomes to this area. Take water as an example. At first glance you might think that the earth is covered with plenty of water so it couldn’t possibly be a scarce resource. But freshwater is only a tiny fraction of all the water on earth. And so freshwater and access to freshwater have become increasingly valuable assets, especially in high population areas where water is scarce. To spot opportunities in water, energy, mining, agriculture, and other natural resources, you can subscribe to the Casey Resource Investor which features new investing ideas monthly. Extraordinary Technology is a newsletter designed to spot the next big company in the technology sector. Historically, the service has claimed to generate big returns, such as 6,300% in Microsoft, 2,600% in Apple, and 4,900% in Cisco. Innovative and disruptive technologies create so much value that they sometimes even change the way we live. Companies like Facebook, Amazon, and Alphabet are mainstream these days but once they were fledgling start-ups with big ideas. But what companies are set to take over the world next? Is it going to be a 3-D printing company, an artificial intelligence company, a cryptocurrency innovation, or the next streaming video service like Netflix? If you missed out on the big runs in previous decades of Apple, Microsoft, Cisco and Intel, then the Extraordinary Technology newsletter may be a good fit for you but it won’t come cheap. Crisis Investing is a newsletter subscription service that gives you access to severely undervalued opportunities. The pitch Casey Research makes for its Crisis Investing newsletter is compelling and starts with the claim that Doug Casey is a multimillionaire who owns 100,000 acres of land in 3 continents. The inference is clear that you too can be successful by following the methods of a successful businessman and investor. The strategy to which he attributes much of his success is revealed in his book Crisis Investing, and shared in this newsletter. In a nutshell, the idea is to buy assets at a 75% discount to value so that they can triple in value and still be down 25% from the highs. An annual subscription to the Crisis Investing newsletter won’t come cheap. It’s a hefty $2,500, but if you purchase it and are unhappy after 30 days you can ask for a full refund. Note that sales tax may be added to your orders. Casey Research is one of the longest running investment advisory services on the market due to its track record and the strong credentials of its founder, Doug Casey. Some of the newsletters on offer are priced highly, however, and you may be interrupted with ads from third-party sponsors from time to time. ✅ Long Track Record: Casey Research has an established history spanning decades and has earned a reputation as a solid investment advisory service that has caught some of the biggest investing waves in recent history from leading technology companies to natural resource plays. ❌ Ad-based Model: Casey Research will send you ads from third-party sponsors from time to time. ✅ Bestselling Author: Casey Research founder, Doug Casey, is a NY Times bestselling author and has been featured on mainstream networks and shows, including Charlie Rose, Fox Business, Wall Street Journal, and MarketWatch. ❌ High Priced Newsletters: Three of the newsletters featured have annual price tags of $2,500 which creates a high hurdle for novice investors to get started. ✅ Low-priced Newsletters: While most of the newsletters on offer are priced high, Casey Research does provide a handful off more affordable financial newsletters. ✅ Potential To Profit From Bearish Trends: As a contrarian, Doug Casey and his team know how to take advantage of bearish trends, economic recessions, and stock market crashes, so rather than holding long positions only through a bearish market cycle, you may uncover opportunities to profit during bleak economic periods. ✅ Doug Casey Credentials: Casey Research founder, Doug Casey, has both the academic credentials and investment experience to engender confidence in subscribers that he’s seen many market cycles and successfully navigated them. 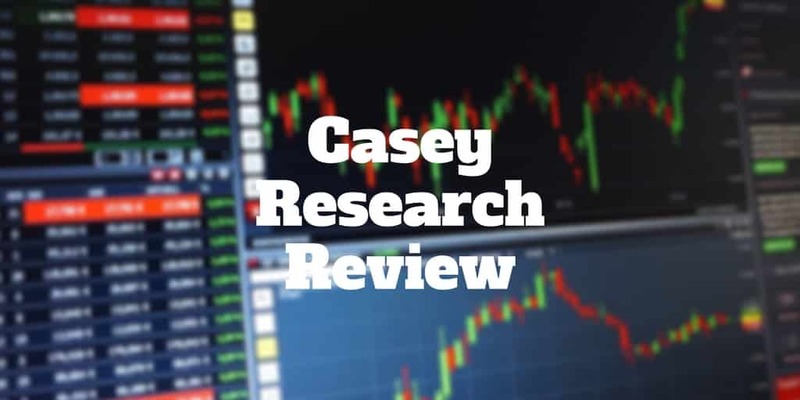 Casey Research delivers a handful of newsletters to investors seeking ideas in the natural resources and technology sectors. The annual price points vary from $99 to $2,500. Casey Research is an investment advisory service that primarily focuses on identifying undervalued natural resources opportunities. If you are looking for a low-cost newsletter with investment ideas across a broad range of sectors, including energy, agriculture, mining, water, and other natural resources, the Casey Resource Investor may be your best bet. The longest running service, International Speculator, is also among the most expensive, costing $2,500 annually and features insights and opportunities in the precious metals and mining industries. And the service with the best track record, Crisis Investing, also comes at a hefty price of $2,500. It is designed to spot severely undervalued assets. For investors looking to spot the latest technology trends coming from Silicon Valley and beyond, Extraordinary Technology is a newsletter service dedicated purely to identifying up and coming tech stocks that have game-changing potential in areas from 3-D printing to artificial intelligence.